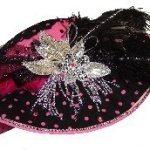 These are handmade for your event in a variety of colors, prints, and styles. 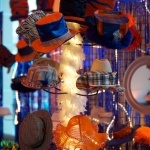 Solidify your theme and give your guests inspiration with our gorgeous decorated hats. 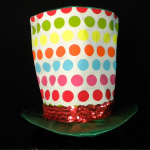 Make your event come alive with added flair! Bring in boas, gloves, masks, ties, and more to make your celebration one to remember. We set up a Party Hats’ Creation Zone. It can be small or large, depending on the number of your guests and the space you have. The Creation Zone is an eye-catching display of pre-made hats along with tables spread with creative materials for decorating the hats.